PALM BEACH GARDENS, Fla. – November 16, 2016 – The National Future of Education Technology Conference (FETC), the largest, national, independent education technology conference, today highlighted many new session tracks, workshops, presentations and learning opportunities available for attendees. During the three-day conference taking place January 24 – 27, 2017 at the Orange County Convention Center in Orlando, Fla., education leaders will be connected with technology experts and leading solution providers to gain a deeper understanding of today’s most innovative technologies. 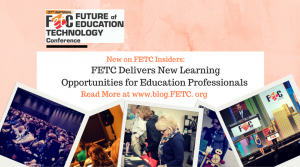 “Attendees of FETC have come to expect a wide variety of diverse and relevant courses, including hands-on opportunities to learn about solutions for their most pressing technological education challenges. With more than 150 interactive workshops and over 400 sessions spanning five distinct program tracks at FETC 2017, there are more options for furthering professional development goals than ever before,” said Jennifer Womble, program chair. In addition to tracks devoted to the learning needs of ed tech administrators and educators, the conference also will feature targeted tracks with numerous dynamic sessions focused on sharing the latest technologies and creative implementation strategies for education professionals in information technology, special education and early childhood education. A brand new addition to the conference, the Future of Ed Tech Special Education track will include sessions and workshops focused on selecting technology solutions to help students with disabilities access state standards, make progress toward Individualized Education Program (IEP) goals and gain universal access to instruction. The Future of Information Technology track will address the professional learning needs of school- and district-based chief information and technology officers, IT directors, IT staff and network administrators, including technology infrastructure, networks and data administration and security. “We are excited to organize the conference around the various roles of the attendee to better match participants’ needs with a multitude of preK-12 professional learning sessions designed specifically for them. This allows thousands of attendees to find targeted sessions of personal interest more easily as they can identify professional development created for administrators, IT leaders and educators to optimize their attendance at FETC,” Womble shared. As learning enhanced with digital and mobile tools has exploded around the globe, FETC is pleased to announce the inaugural FETC Mobile MEGAShare, providing a forum for educators to share and learn from each other and enrich the academic experience for students. Experts will facilitate share sessions on rotation so participants can attend the topics of their choosing, with the opportunity for conversation, reflection and evaluation of current research and professional practice in order to make effective use of existing and emerging digital tools and resources in support student learning. This highly collaborative bonus event is open to FETC attendees but does require additional registration, the Mobile MEGAShare is scheduled for Wednesday, January 25 from 8:30 a.m. – 12:30 pm EST. Also taking place on Wednesday, January 25 will be the FETC Computer Science FIREHOSE event, dedicated to professional development for Computer Science education. A fundamental skill for staying competitive in the future, students, parents, educators and the industry all have a vested interest in better integrating Computer Science into the K-12 experience. The Computer Science FIREHOSE is designed to engage educators and administrators tasked with developing and maintaining successful Computer Science programs and providing resources that inspire students to take interest in the field. This pre-conference gathering is open to FETC attendees seeking to follow new trends in Computer Science education via an unrestricted flow of presentations and data flowing from one huge nozzle. This year, the Expo Hall will feature more ways to increase technology skills and advance professional learning. Attendees can visit the new Skill Builder Theater, from Wednesday – Friday, to engage in 20-minute, hands-on demonstrations targeting and teaching skills that can be learned and shared in a district, school or on campus right away. Also, in partnership with the Software & Information Industry Association (SIIA), FETC PitchFest will feature technology startups participating in a competition that gives each company five minutes to pitch their product in front of a live audience. The PitchFest competition builds on FETC’s long history of being at the forefront of education technology, giving attendees a first look at the latest innovations changing the game for education professionals. FETC keynote presentations will offer attendees the unique opportunity to hear from experts about new methods for using technology to enhance education within their schools and districts. During the Awesome New Technology opening keynote on Wednesday, January 25, attendees will be inspired by the future of educational technology and its potential for revolutionizing teaching and learning. In this presentation, six industry leaders will share engaging and interactive product demonstrations of the latest technological tools that impact all facets of education. On Thursday, January 26, the keynote by Michael Meechin, principal of Poinciana High School, will focus on how schools can leverage the power of technology to implement high-impact instructional strategies. Tech Share LIVE! on Friday, January 27 will provide attendees renewed enthusiasm for adopting the most exciting and cutting-edge gadgets, apps and hardware and software tools available today in education technology. Both first-time and returning FETC attendees will want to attend the New @FETC session on Wednesday, January 25 at 11:30 a.m. EST to hear more about other important professional learning opportunities throughout the conference. During the session, FETC program chair Jennifer Womble will offer an informative overview of the new session tracks, workshop topics, keynote sessions and special events available for attendees. Additional information about FETC 2017, including more details about FETC tracks, sessions, workshops and registration, is available at www.FETC.org or by calling toll-free 1-800-727-1227. Professionals registering by Friday, November 18, save $150.00 off the current rate.